Ramadan has started (رمضان كريم! ), which means things have gotten quiet in Algiers - no traffic in the morning on the way to work, the pleasant silence as the sun sets for iftar. Everyone here talks about how the prices have gone up for Ramadan, and indeed they have. Food is not cheap here to begin with (fruit and vegetables are relatively inexpensive but meat and cheese prices are often more than in the U.S.), and there are lots of news stories about prices and food insecurity. We've been here a month and we realized that we've barely had any traditional Algerian food - that is couscous and tagines and the like, and sadly most of the restaurants are closed for Ramadan. Having made a few tagines before (beef and prune, chicken with olive and preserved lemon), I was searching for a new variation. 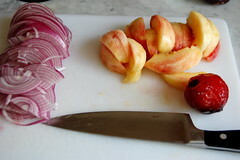 I came across this recipe for nectarines an plums (in season!) stewed with chicken, and interestingly with black olives thrown in. Tagines are dishes that involve very little stirring or active time, the whole idea is to layer flavors in a pot and simmer them slowly until they break down into one cohesive delicious mass. I found this tagine to be particularly excellent, with the fruity sour-sweetness and pervasive spice almost like a delicate curry. The olives and preserved lemon melt into the background so that they are virtually recognizable, but they contrast the sweetness of the fruit. I highly recommend making this while good stone fruits are still in season. Really ripe nectarines and plums should be easily peeled by just pulling the skins off. If you don't have the preserved lemon here it's okay to omit it or just substitute some lemon zest. If you don't have harissa, any chili paste will do. 1. Season the chicken with salt and pepper all over. Heat a bit of olive oil in a tagine or a large heavy-bottomed pan with a lid. Add the chicken to the pan and brown on all sides. Set the chicken aside. 2. Add the onion and saute for a few minutes, stirring occaisionally. Add garlic and ginger, stirring for a minute, then add the nectarines and plums, water, paprika, cayenne pepper, cumin, turmeric, cinnamon, saffron. Season with salt and pepper and let the mixture simmer, covered for 15-20 minutes. You may want to mash the fruit a bit to encourage it to break down. 3. Add the chicken, preserved lemon, olives, harissa, and honey. 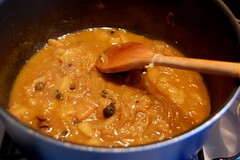 Cover the pan and simmer for 25-35 minutes, until the chicken is tender and the fruit is cooked down and stew-y. 4. 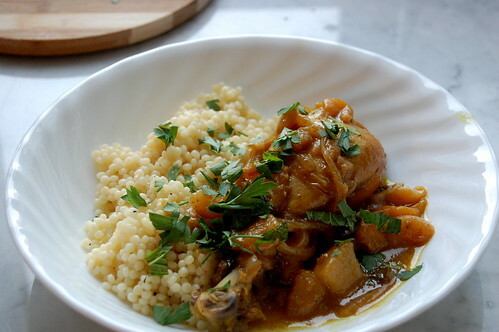 Serve over couscous and garnish with parsley and cilantro. I've been reading your blog for some time now as I'm a huge Middle Eastern food fan and have traveled there some. So first, I just wanted to say thank you! Your blog is a delight. Secondly, since you mentioned harissa in this post, I was going to see if you have a recipe that you like for harissa? We just moved from Chicago where we had an incredible Middle Eastern store that sold the homemade kind and our palates are sorely suffering from lack of daily harissa. I was thinking of trying Paula Wolfert's recipe, but I welcome your suggestions. Mouthwatering. Looks so yummy. Happy weekend. Hi Cat! Thanks for your comments. To be honest, we buy harissa at one of the open air markets here. It's on my list to try to make my own, but we haven't gotten there yet! I'd be interested to hear what you think of Wolfert's recipe if you try it out though. Bonne chance! You used pearled couscous, didn't you? lynn2marry- great! I'm glad you enjoyed it. 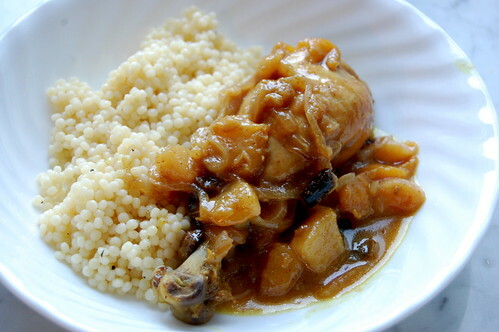 And yes on the pearled couscous, I'll have to do a post on the different kinds of couscous here once I learn more about them. Cat - Hmm, yeah, I know lots of people here makes their harissa with fresh red chiles, blended with oil and some other unknown spices. My impression was the dried chiles were only preferred when fresh chiles are out of season. I've never heard of adding sundried tomatoes (I don't know if you can even get sun dried tomatoes in Algiers). Delicious looking! I think I'll try it today.